The Port of Aabenraa is one of Denmark’s 20 largest commercial harbours and is a market-oriented harbour enterprise that focuses its products on the needs of its customers. Facilities, traffic conditions and services are developed and upgraded on an ongoing basis in order to ensure that the port always remains abreast of the needs of its customers. The Port of Aabenraa is the deepest public Danish commercial harbour in the western part of the Baltic Sea and lies close to the European motorway network. The harbour acts as a loading and unloading harbour for the entire Baltic Sea and is incorporated into attractive transport concepts in combination with road traffic to and from the rest of Europe. The Port of Aabenraa has great importance for employment in the region. 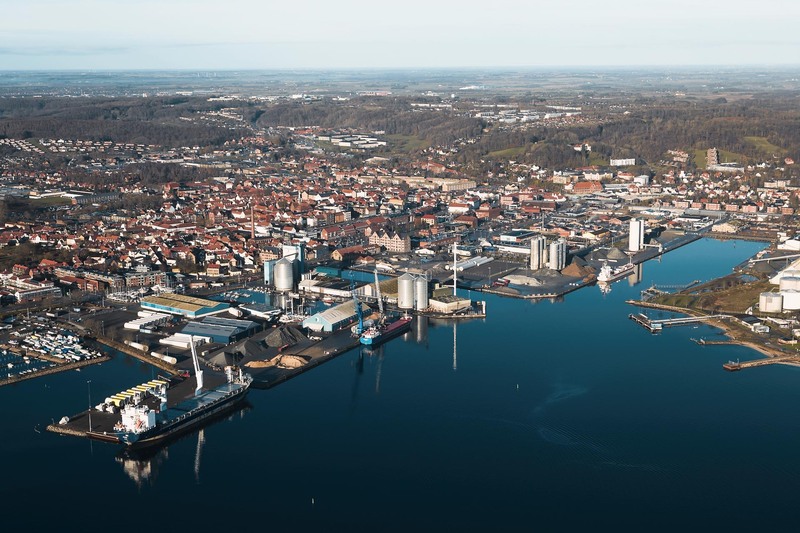 The most recent survey, conducted in 2013, reveals that the harbour directly and indirectly creates more than 1,800 jobs in the region, with these workplaces generating more than DKK 300 million in tax. With respect to employment in the area, we have a duty to continue to attract activities and generate growth and jobs. As an employee at the Port of Aabenraa you must therefore always remember that your efforts mean a great deal, not only with regard to the customer concerned, but for our region as a whole. The Port of Aabenraa has a robust network, and a wide range of transport-related businesses are today represented at the harbour area. The harbour also offers favourable logistics solutions in collaboration with Padborg Transportcenter, which is located on the E45 motorway at the Danish-German border. The transport centre has extensive experience of combined seaborne and overland transport, and the enterprises here have daily departures carrying an extensive range of goods to the whole of Europe. With regard to goods transport between Denmark and Germany, the Port of Aabenraa has the added advantage that the harbour represents a viable alternative to the congested German highways.